Pet owners sometimes assume that a dog squinting one eye is adorable, but in reality it could be a major eye problem for your canine. Left untreated, your dog could experience glaucoma, inflammation, cataracts, conjunctivitis, cherry eye, and even blindness. As a dog gets older, it tends to get health issues like corneal ulcers, progressive retinal anomalies, and retinal degeneration. Simple injuries can lead to major problems if you do not treat them early. This article provides all needed information about those squinting eyes of dogs. If you see your pet avoiding bright lights or squinting heavily when faced with normal to bright light, there could be something in their eye. Seek out tiny particles by lifting their eyelids with a thumb. Repeat for lower lids, using your other hand. Use tepid water to flush out debris on the surface, or a cotton swab dipped in water to gently extract it. This sounds easy but it actually can be tricky because it needs your dog's high cooperation. If for some reason you are unable to get that object out without risk or danger, immediately bandage the eye (wrap around the head) so the doggy has it closed until you drive them to the veterinarian. If your dog is scratching it unduly, slip an Elizabethan collar round its neck and take it to the vet. This is considered a medical emergency, so be sure to let the front office know so they can get a doctor to see your pet without delay. Too many times, a dog squinting one eye is due to scratching in eyes but this squinting in turn can lead to more eye scratches and tears. This will result in eye redness, so make sure you follow the previous step to fish out any debris if that is the cause. 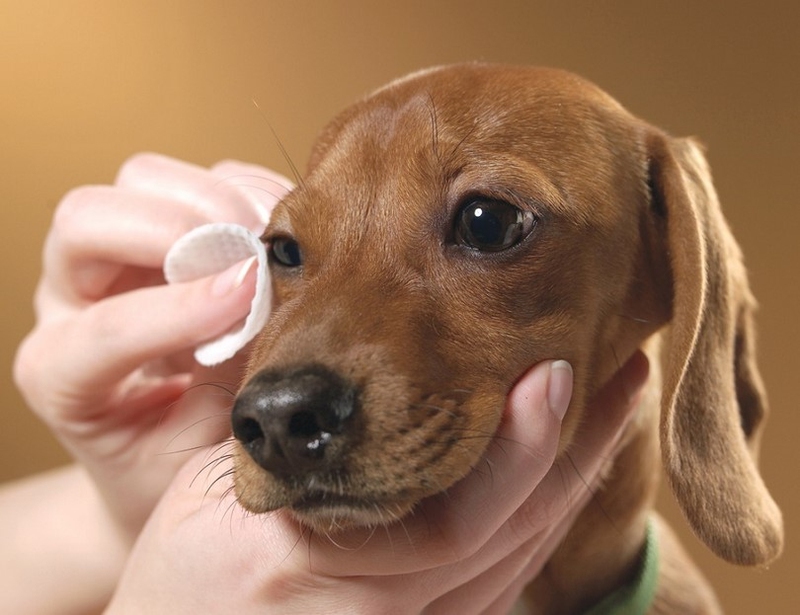 If you find nothing but your dog scratches constantly anyway, use a clean damp cloth to cover the eye, wrapping it around like a bandage. You can also put an Elizabethan collar on your pet, or even bandage their dewclaws so they do not hurt their eyes even if they scratch. You must take them to see a veterinarian that very day. This is not a "cure at home" scenario. Symptom: If your dog’s eyes do not produce a good quantity of tears, it will result in their conjunctivae and corneas becoming dry, irritated, thickened and inflamed. Dry eye, called "Keratoconjunctivitis Siccac" in medical jargon, is an infection that can lead to corneal ulcers, vision impairments and even blindness. Causes: In most cases, the cause of this disease is unknown; however, an autoimmune condition seems to accompany its occurrence. 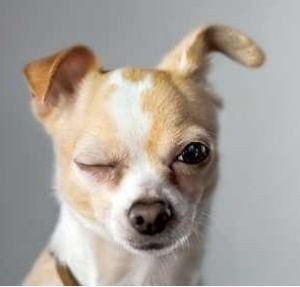 Other conditions that can lead to dog squinting one eye includes removing the third eyelid gland pre-surgery, trauma, general anesthesia, diabetes, canine distemper, diseases like Addison’s and Cushing’s, hyperthyroidism, and the application of particular antibiotics. Treatment: OTC products are indeed available but it’s wiser to ask a veterinarian’s opinion before proceeding with one of those. Bear in mind your dog most probably has an eye infection that needs immediate medical attention, if it shows extreme light sensitivity, squints too often, has swollen eyelids with red or inflamed eyes, blinks a lot, has a dry and dull-looking cornea, or the third eyelid is too protrusive, or its eye discharge is yellow/grey/green in color. Symptom: Watery, red and itchy eyes may indicate an allergy, which can lead to an inflamed conjunctiva and infections. Other active signs include dog squinting one eye, face scratching, eye pawing, sneezing fits, sniffles, etc. Causes: Allergy in dogs has a variety of causes and the most common one is due to inhaled substances. Like people, a dog can get runny nose and watery eyes from inhaling certain allergens. There can be yearly allergens like molds, dust or mildew, and seasonal allergies like pollen. Treatment: Treatment certainly includes a trip to the vet, specifically a veterinary ophthalmologist. If this is genuinely an allergic reaction, your dog will require allergy shots, antihistamines, or anti-inflammatory medications. Once the vet helps identify what causes the allergy (say, mildew) you'd better safeguard your pet from it both indoors and out. Tissue inflammation on the whites of your pet’s eyes or around the inner eyelids, dog squinting one eye, or dog having bloodshot/grimy eyes and swollen eyelids can be signs of conjunctivitis. Although rare, blindness can be an end-result. The causes can ranges from canine distemper, dry eye to actual airborne irritants. And conjunctivitis can also occur with eye injury (like blunt object trauma) and respiratory infection. Treatment: With conjunctivitis, severity varies among pets. The veterinarian will administer treatment according to severity. Drops or ointments are often the leading choices. Medication will continue throughout the course of treatment. In some cases, it ends with antibiotics but where cases of Entropion (a malformation of eyelids that makes a dog's eyelids to roll inward and scrape against eyes, causing eye irritation) are concerned, your dog might need surgery followed by long-term management. Eye infection can lead to overly sensitive to light, swollen eyelids, sticky or watery discharge leaking from its eyes, squinting with either one or both eyes, inflamed or red and cloudy eyes, or your dog simply scratching its eyes too often. Juvenile cellulitis, or called "puppy strangles": Bacteria are responsible and you can see your pet, especially in puppyhood, develop blisters around their eyes. These can in turn lead to ulcers. Glaucoma: By blocking portions of the eye, this infection places pressure on your eyes. From enlarged pupils to cloudiness or redness, the symptoms can progress into blindness if left untreated. A vet will administer varied treatments for relieving pressure and soothe infection, while keeping your pet’s eye-neurons safe. This is one of the more complicated infections to treat. Take your dog to a licensed veterinarian at once if you notice symptoms like dog squinting one eye, sensitive to light, and other infection symptoms, or if your dog's eye discharge is yellow, grey, or green. To alleviate its discomfort afterwards, use a mild saline solution (1 tbsp. salt + 1 mug mineral water) to clean the eyes with cotton balls. Your vet will recommend or sell quality eye cleaning solutions at their office or know a place nearby. If the infection is really bad, the vet may have to perform a surgery to cure your dog. Prevention the occurrence of dog squinting one eye is definitely better than trying to find a cure. With monitor puppies at play, avoid airborne irritants like fresheners and cigarettes around your pets. Let your dog have enough exercise to lower its risk of getting infections and improve its immune system. Regular check-ups and vaccinations are an effective way to fight eye infection beforehand. Server responsed at: 04/23/2019 4:30 a.m.